When it comes to the Estrada nomination, Senate Democrats just can't seem to get the facts straight. And no wonder-they seem to think not having anything to use against Estrada means they don't know enough about Estrada. While filibustering this nomination, they've made several allegations that distort the truth or misrepresent Estrada's answers to questions from Senators. Allegation: Estrada isn't qualified because he has no judicial experience. Fact: Even though he hasn't served as a judge, no one can truthfully argue that Estrada has no judicial experience. He clerked for Circuit Judge Amalya Kearse on the Second Circuit and Justice Anthony Kennedy on the U.S. Supreme Court, assisting both in the research and writing of their judicial opinions. He has argued 15 cases before the Supreme Court and received a unanimous well-qualified rating from the ABA, "the gold standard" according to leading Democrats. What's more, five of the eight current D.C. Circuit judges had not been judges before their appointment to the Court of Appeals. Nothing-not even the fact that he's a non-liberal Hispanic-justifies raising the bar for this well-qualified and highly respected nominee. Allegation: Estrada won't let Senators see the legal memoranda he wrote while working for the Office of the U.S. Solicitor General in the first Bush and Clinton administrations. Fact: At his hearing, Estrada told Sen. Schumer that if it were up to him, he would release the memos. However, these are covered by attorney-client privilege, and only his client-the Justice Department-has the right to make that decision. Recognizing the dangerous precedent this would set, not to mention the chilling effect on attorneys expected to give honest and forthright counsel in confidence, the Justice Department has declined to hand them out. Every living former Solicitor General agrees with that decision. Allegation: Estrada doesn't have the temperament for an appointment to the Court of Appeals. Fact: The only credible references come from people with no axe to grind. Clinton Solicitor General Seth Waxman says Estrada is "a model of professionalism and competence." Leonard Joy, Attorney-in-Charge of the Federal Defender Division of the NY Legal Aid Society, says Estrada gets along "with people who may have different views." Former Gore counsel Ron Klain says Estrada "will rule justly toward all, without showing favor." And even Paul Bender-oft-cited by Democrats today-gave Estrada "outstanding" job performance reviews in every category, back when he wasn't out to torpedo his former subordinate's nomination. Allegation: Estrada didn't answer questions about his judicial philosophy. Fact: Estrada repeatedly explained his judicial philosophy. It was his political ideology that he declined to discuss, believing it has no place in his decision-making as a judge and that it would be improper to commit to positions on controversial issues. After all, he is a nominee for an impartial federal judgeship, not a political candidate running for office. He also recognized the problems with answering questions that would compromise his ethical stand on politically-charged questions. Estrada explicitly told Senators his judicial philosophy involves setting aside personal views to the best of his ability and following the law and Supreme Court precedent. 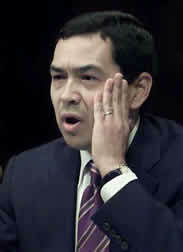 Allegation: Estrada is opposed by much of the Hispanic community. Fact: Estrada is supported by most major national Hispanic organizations, including the League of United Latin American Citizens, the Hispanic National Bar Association, Puerto Rican American Federations, the Hispanic Business Roundtable, The Latino Coalition, Association for the Advancement of Mexican Americans, U.S. Hispanic Chamber of Commerce, and many others. While these groups know Estrada deserves confirmation solely on the basis of his record, they are nonetheless proud that he will be the first Hispanic on the D.C. Circuit. Allegation: Left-wing Hispanic groups are credible when they complain about Estrada's nomination. Fact: As Estrada explained to Sen. Kohl during his hearing, one Puerto Rican Legal Defense Fund official said his group looked into it and decided that Estrada is not "really" Hispanic. Angelo Falcon of that group recently said genetics and surname don't make someone Hispanic. Rep. Menendez of the Congressional Hispanic Caucus says "being Hispanic for us means much more than having a surname." Marisa Demeo of the Mexican American Legal Defense Fund argues Estrada isn't an authentic Hispanic. These remarks expose their real reason for opposing Estrada: he's not "real" Hispanic because he's not a liberal Hispanic. Why are Democrats willing to cite these bigots as a reason to filibuster Estrada's nomination? The truth is that Estrada is a highly qualified nominee with a stellar record and endorsements from prominent Democrats, Republicans, and Hispanic organizations. Nothing justifies the Democrats' filibuster-the first used against a circuit court nominee in the history of the Republic. And nothing excuses filibustering a nominee simply because he is an independent-minded Hispanic.